Last year’s harvest for our blog took place in the aftermath of a snowstorm. This year, not to be outdone, the weather unleashed a windstorm the likes of which I have never before experienced. While I was watching the trees and wondering if I should really call off work for the day simply because it was windy, I watched the top 15 feet of an 80 foot Douglas fir break off and come crashing down. It certainly helped me with my decision to postpone the harvest. B.C. 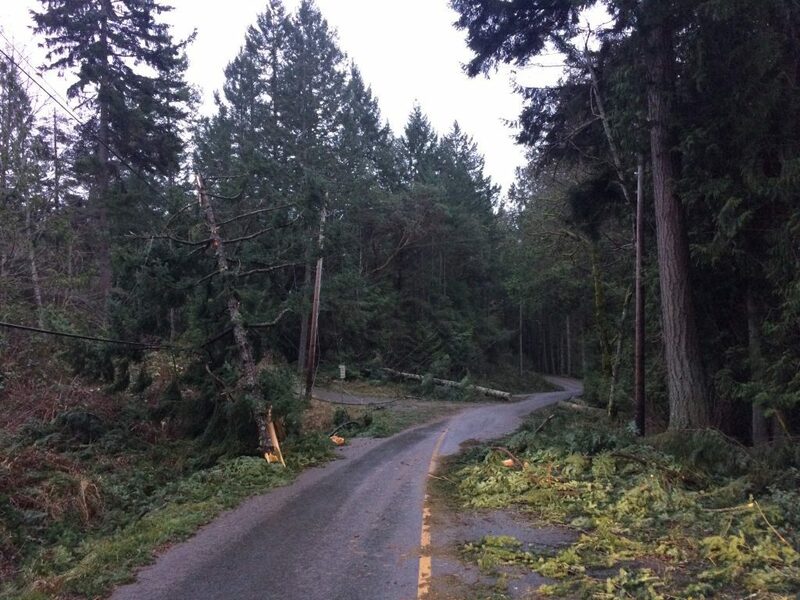 Hydro called it the worst storm they have ever dealt with and where I live we were 8 days without power. Local citizens chainsawed their way home through trees wrapped in power line. This was a dangerous call for these individuals, and if they had not made it, it may have been a while before hydro could send over an arborist with the correct certification to deal with the damage. 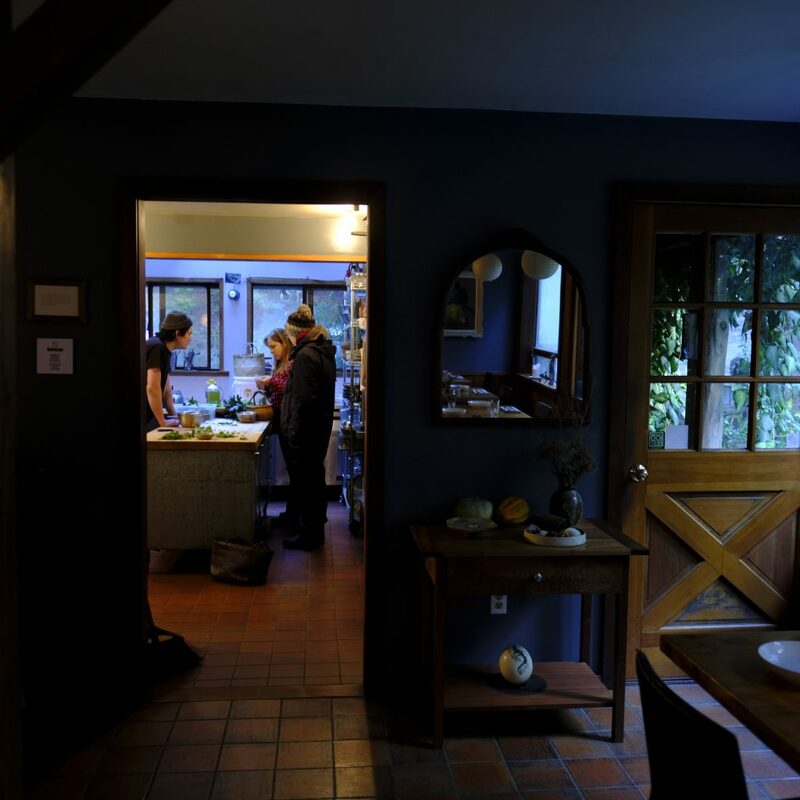 This led me to thinking about our food self-sufficiency and I wondered what sort of meals could be made if we were isolated on our little part of the island. Food preservation is always a big part of good winter eating, but I was also curious about the type of meal we could harvest and enjoy directly from the Food Forest. 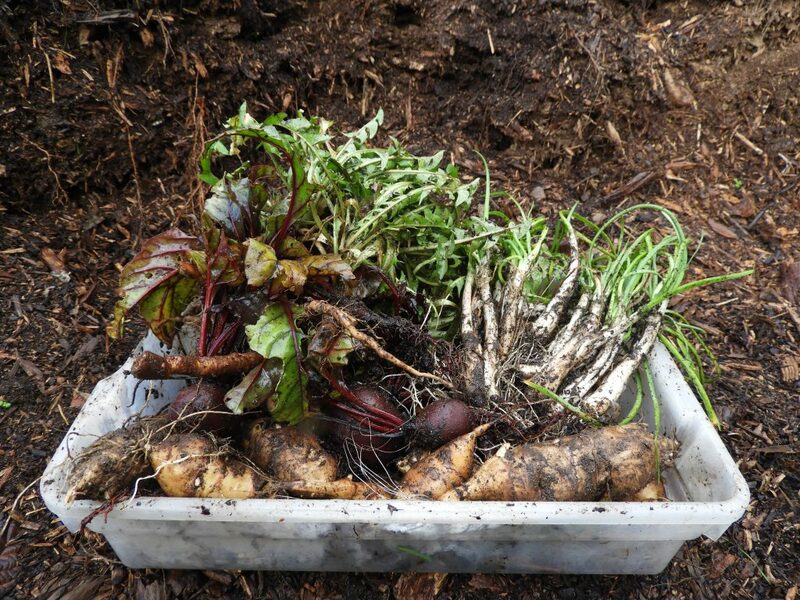 In our climate quite a few root crops can be stored right in the ground, protected with some mulch. Green growth slows dramatically but a number of tasty green morsels can still be harvested in the dead of winter. Our survivalist scenario dramatically improves with the addition of intensely talented award winning chef Jesse McCleery from pilgrimme. 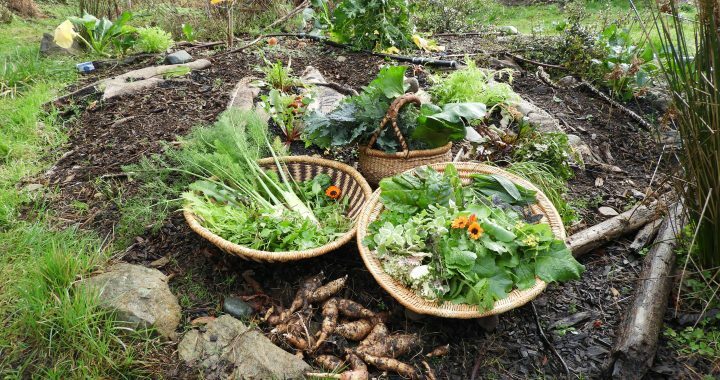 The thought of the unique, seasonally available Food Forest fare is now brimming with the potential of transformation and creativity. But first the harvest: While looking for late winter greens we notice some big patches of peppergrass (Cardamine histusa). Young peppergrass leaves can be used anywhere you might use watercress. The tiny white flowers are tasty too (I saw a few little plants blooming already). It grows in a compact basal rosette form with 5-9 curvy paired leaflets. Once pollinated, these flowers form into long, thin seedpods that are dehiscent – when ripe, the slightest touch will cause them to pop open loudly (for a plant) and shoot their numerous seeds off in every direction. Peppergrass is a member of the Brassicaceae family, placing it in the company of mustards, cabbages, and broccoli. I have eaten it in sandwiches and in salad mixes and I am so curious to see how Jesse uses it. Other favourite weeds that make it into the basket include sheep sorrel (Rumex acetosella), a small sour arrow-shaped leaf reminiscent of childhood outdoor snacking. That desirable sour flavour is common in other plants in the Polygonaceae family such as garden sorrel and rhubarb, and comes from oxalic acid. Oxalic acid can be beneficial to digestion but eaten in excess can also be detrimental to mineral absorption and can aggravate the kidneys. So enjoy them as occasional treats, but be sure not to overindulge. Another unplanted but much enjoyed green in our Food Forest is ox eye daisy greens. These curvy little morsels are tastiest when young and remind me of the flavour of shungiku, or edible chrysanthymum. The familiar dandelion (Taraxacum offinale) with its bitter greens and root also made it into the basket. Next we have a wild native green called miners lettuce. Claytonia perfoliata is a beauty of a plant. It grows in a rosette shape with leaves that start out heart-shaped. When they are ready to flower the plant sends up leaves that appear to have the stem pass through, sending forth multiple beautiful little white flowers. Miners lettuce is a mild, slightly succulent, refreshing and enjoyable little green. Another popular wild native green that has found a comfortable home in our Food Forest is nodding onion (Allium cernuum). The last couple of years we have harvested our nodding onion as a similar, but flatter version of chives. Today we reached our goal of having a big enough patch that we can separate out bulbs to harvest and roast. Anticipation is high! 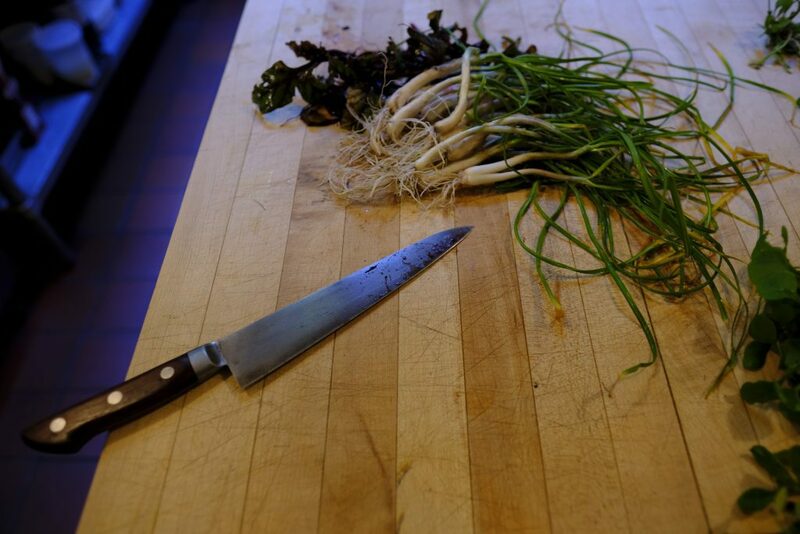 More commonly cultivated winter greens follow: kale, chard, pac choi, mizuna, radish greens, mache, jupiters tongue, and a cold hardy cultivar from B.C. Eco Seed Coop called White Winter kale sprouts. To round out this abundance of green we also harvested a basket of beets and a bucket of sunchokes. Most of you are likely familiar with beets and their deep dark red earthiness, and while still unusual, sunchokes are also gaining in popularity. Sunchokes (Helianthum tuberosum) have a big presence in the Food Forest. They spread easily from a single tuber and in the spring will quickly grow into a 4-5ft plant. In the summer each tall stalk will bear a tiny sunflower. We have a few varieties: some red, some white, some knobby and some slender and easy to clean. Sunchokes have very little starch but instead have large amounts of inulin. Inulin is a prebiotic and is a great food for gut health, but I would recommend trying a small amount before indulging. Often when someone is unused to eating inulin, the gut bacteria will get overexcited resulting in gas and bloating. So proceed with caution! Sunchokes have a mild creamy flavour that is enjoyable roasted or cooked in soup. 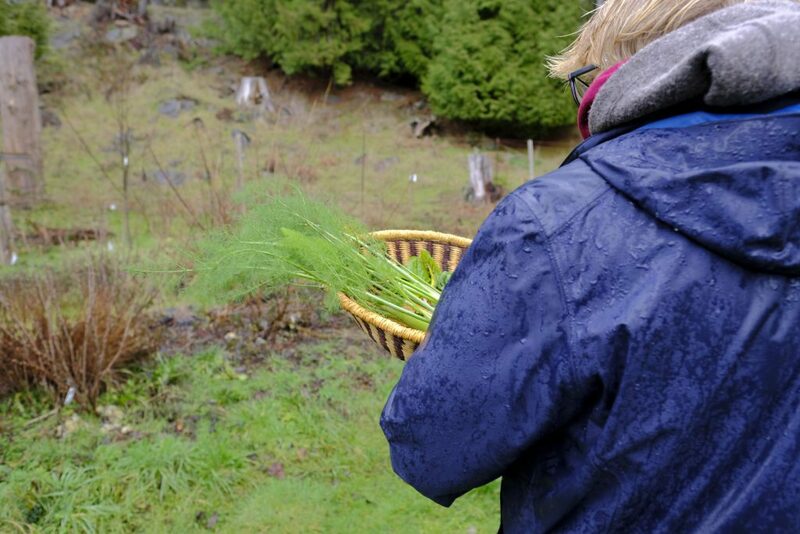 To finish off the harvest we gather the herbs: There are still a few herbs that have survived the cooler temperatures including Hairy Mountain mint, Pineapple mint, fennel bulbs and greens, and purple sage. With our baskets brimming we set out on the 6 kilometer trek to deliver our freshly harvested offerings and to witness the transformation that takes place in pilgrimme. On our arrival, after everything is thoroughly washed, Jesse immediately throws a number of sunchokes directly on the grill to bbq. The nodding onion greens are chopped up and placed in a steamer on top of which Jesse places the bulbs and some sage leaves. The earthy, onion-y, herbal aroma as it cooks is enchanting. The radish tops and some of the nodding onion greens are chopped up and blended together until they reach a sauce-like consistency. The beets and dandelion roots are added to a broth made with the wide array of Food Forest aromatic herbs. 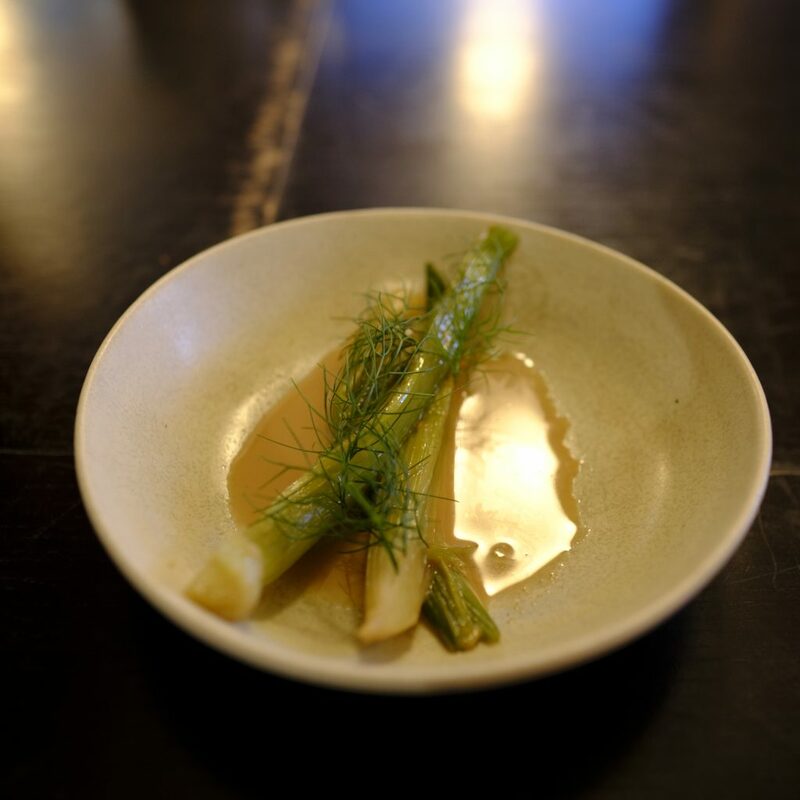 The fennel bulbs are braised in a broth made from the leaves and a slight aromatic sweetness starts to mingle with the other earthy aromatic smells filling the kitchen. Jesse adds a little of his own barley miso, and a spoonful of cajeta, a sweet caramel sauce I brought along, an offering from my goats who also live here mid-island on Galiano. Some kale joins the sunchokes on the bbq and then all is brought into the kitchen. All three dishes come together quickly now. The sunchokes are opened up like a baked potato and stuffed with the chopped bbqed kale and steamed nodding onion. White kale sprouts are placed on top with a scattering of hardy calendula flower. 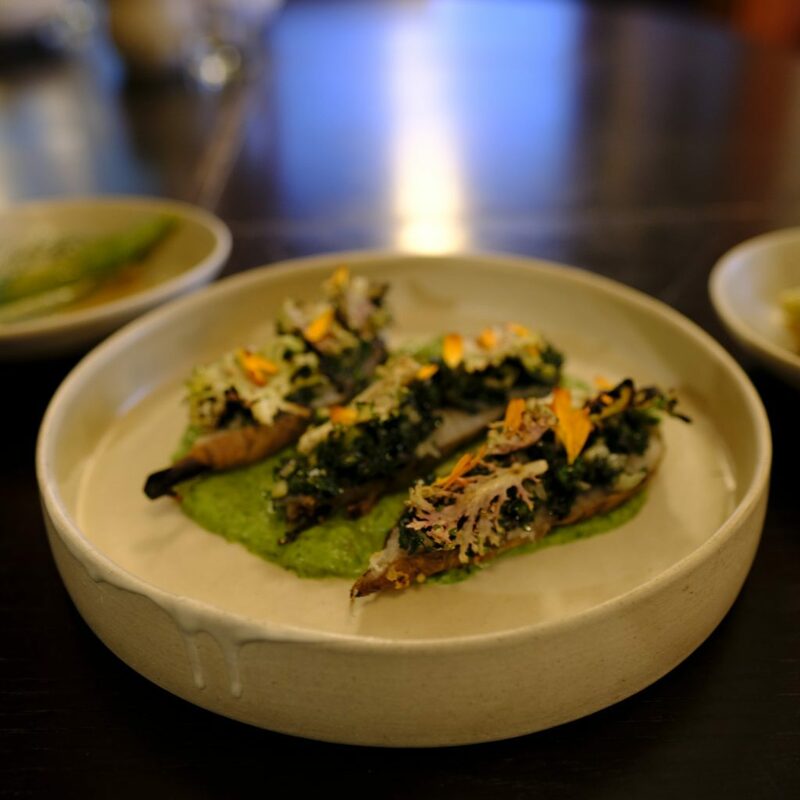 The braised fennel is plated with a delicate lace of fresh fennel fronds. The beet is livened up with a vibrant green peppergrass and parsley salad. Silence descends as we enjoy our delicate 3 course winter Food Forest meal. My first taste of nodding onion bulb is memorable: a sweet, roasted, deep richness. 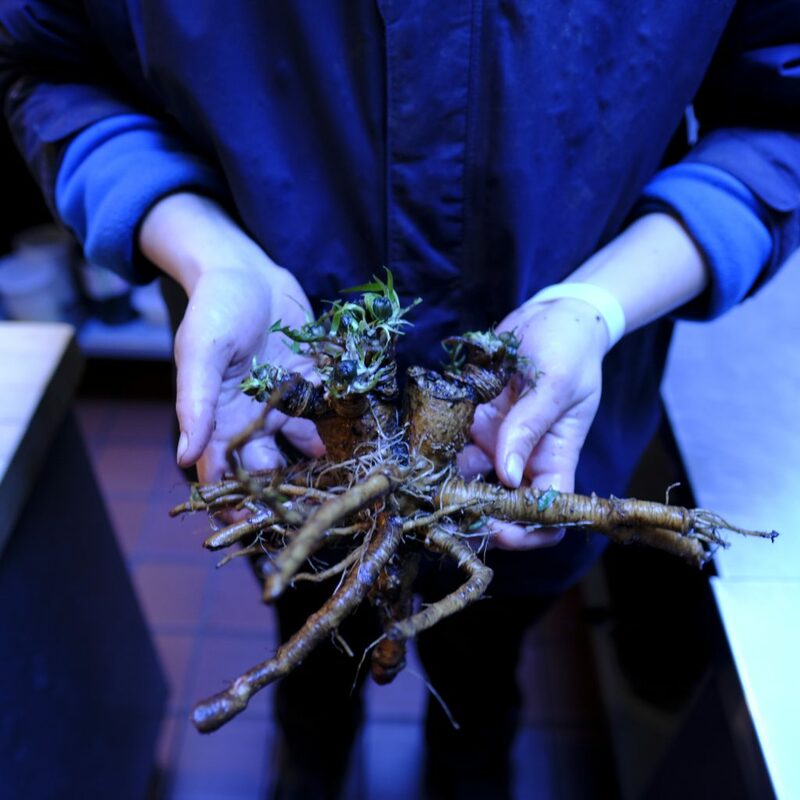 The sunchoke is creamy and earthy, the skin caramelized. Every mouthful has layers of flavour, each elegant and nourishing. The meal transcends my concept of survival food, and yet is made of ingredients that are sourced during the least abundant time in the Food Forest. 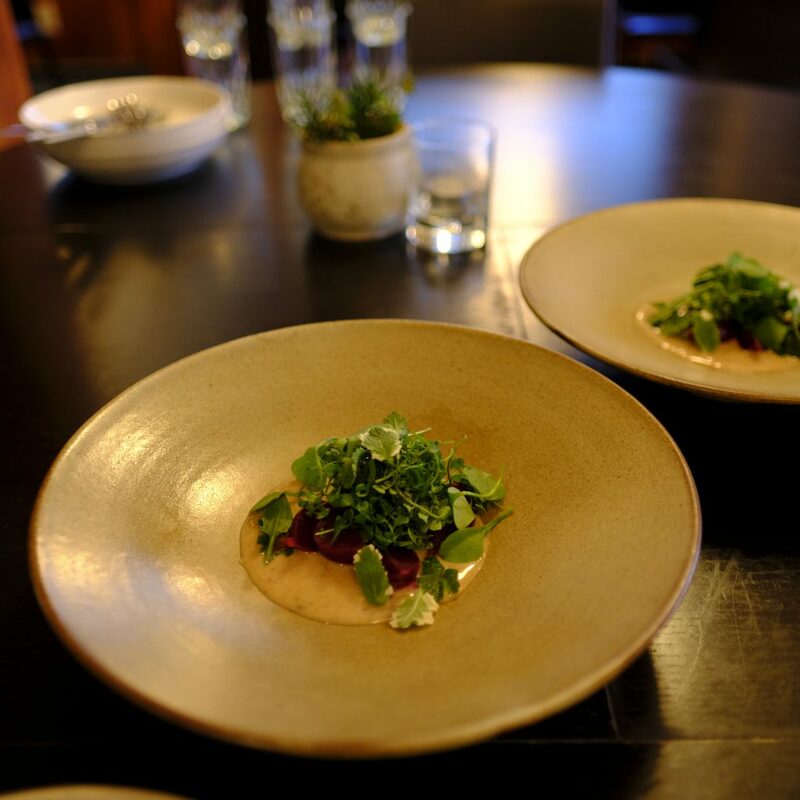 Certainly, we are lucky to have a magician of a chef skilled in using local ingredients create a beautiful, nuanced meal for us, but the unique flavours could be incorporated by any creative cook. 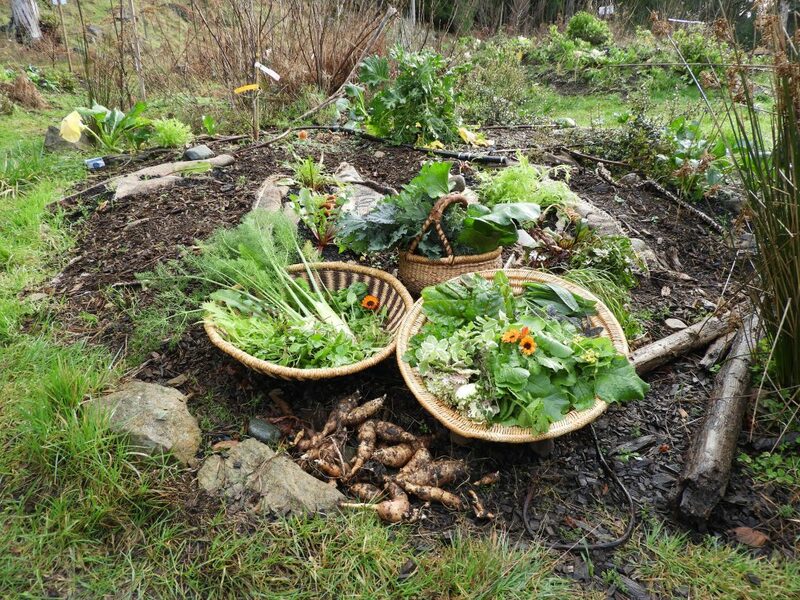 This amazing meal was truly an inspiration for what is possible with our resilient mid-winter Food Forest plants. Cedana Bourne is GCA’s Agriculture and Nursery Coordinator. 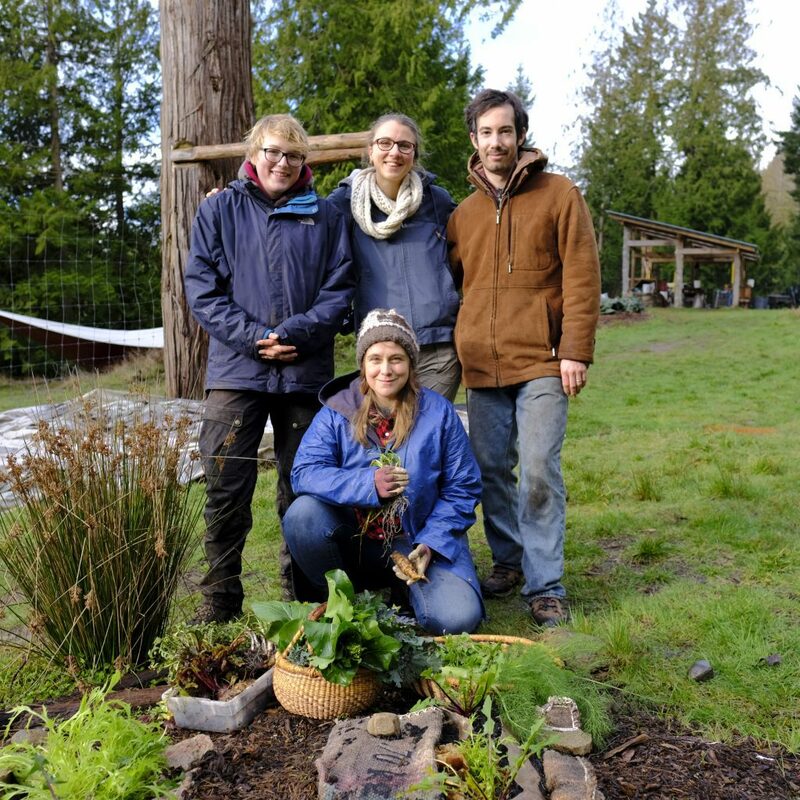 You can find her with her hands in the soil at the Native Plant Nursery, the Learning Centre’s Food Forest and the garden and greenhouse. Cedana is in her element when she can observe and participate in each stage of the cycle of life. Cedana is a herbalist who grows or wildcrafts the plants for the formulas she creates for her apothecary. Cedana is also a Registered Holistic Nutritionist who appreciates a delicious whole foods meal. She is a passionate preserver and loves to incorporate wild foods into all kinds of tasty creations from baking to bubbly brews to fermented concoctions. ← Rockheights Sees under the Sea!